The Madison Area YMCA is a lovely establishment that offers many, many activities, and after making every single excuse in the book, including a zit on my chin, the weather being "too nice," the night being "too dark," and "well, I just HAVE to finish these Frosted Flakes before I get in shape or they'll just go bad," I went. Here are 31 thoughts I had during my first trip to the Y. How do you even get into a sports bra? I've had these sneakers for about 20 years. Are they still good? Probably, it's not like I've *used* them in 15 of those years. Okay, I look reasonably cute. Time to go. Wow, there are a lot of people here. The treadmill! Hello old foe. Let's get re-acquainted. It's been 2 minutes. Am I buff yet? It's been 4 minutes. Can I stop yet? I can't believe there are televisions built into the treadmills. Things have changed a lot since 2001. Okay, 30 minutes on the treadmill done. On to the machines. Surely I'll be buff in like, three minutes. Uh. This one looks complicated. I'll ask for help from one of the lovely YMCA employees. I'm doing this wrong. I don't bend that way. It's for my glutes. My glutes don't bend that way. Oh no, I'm stuck in this machine. Help! Help! Tell my friends my glutes looked fantastic when they find my body. Okay, machines done. SURELY I'm buff now. I look...exactly the same. But sweaty. I guess that's why people go here every day. I cannot be Veruca Salt. Even though I want it NOW. Look at all these people, running on purpose. Arguably for fun. Am I going to become one of those people? A person who runs for fun? My dad will be super proud of me. He's been wanting me to run for fun my whole life. Run for fun? Hahahhahahaha. In another dimension, that's where that's going to happen. Let's get realistic. Getting in shape takes time, and discipline, and hard work. I'm really bad at those things. Ooooof. I ache. Perhaps I did too much. Oh I definitely did too much. Okay, this will get better in time. Definitely. Hooray for the Y! 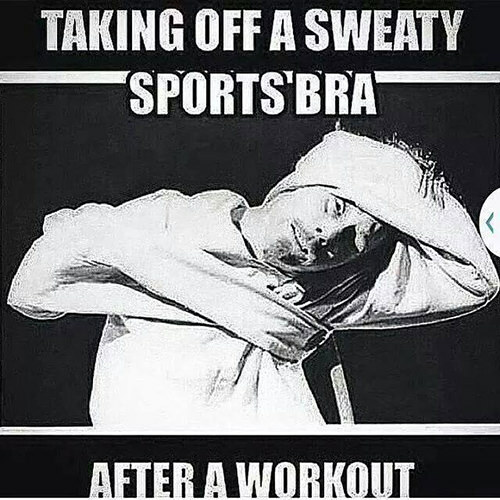 Uh, how do you get out of a sports bra?